It was time. It was really time. I have a purse I love, that I am so excited to pull out every fall. But it was full of junk. Full. of. junk. Time for a big purse dump. And since I have a blog, you get to share the fun . 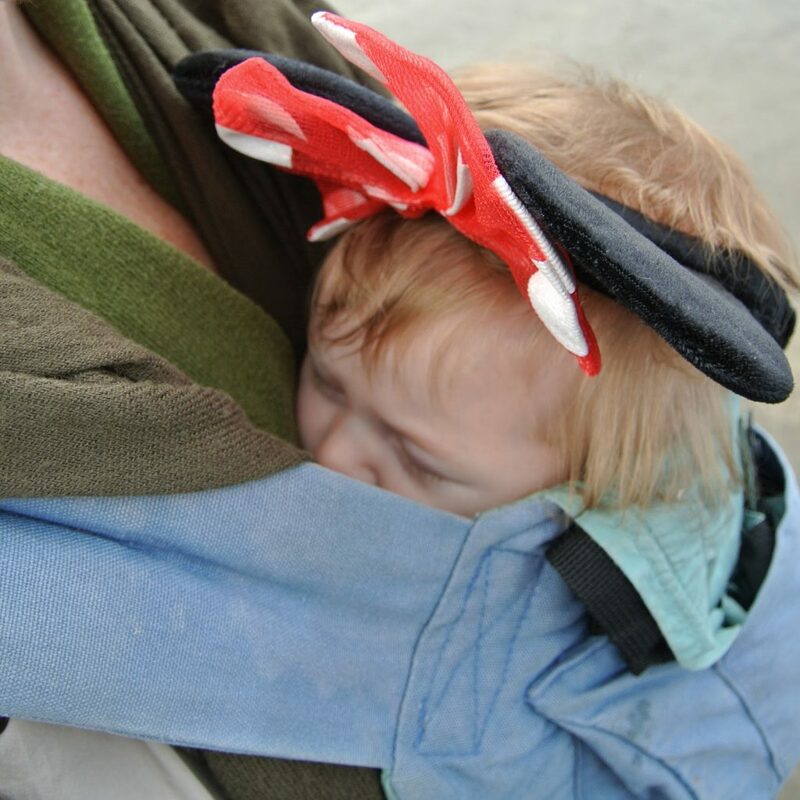 . .
At 11.2 lbs, it is the second heaviest thing I carry around all day. 1. Diapers: In sizes newborn, 1, 2, and 4 because apparently I’m never quite sure what size my baby is going to be that day. Also, no wipes. Yikes. 2. Random miscellaneous items: Embroidery floss, folding scissors, a magnetic rock with four safety pins stuck to it, a rubber band, and a nail made by a blacksmith at the LA County Fair in 2012. You just never know when something like that is going to come in handy. 3. Rosaries: A rosary is a good thing to have in your purse. I like to multitask, so I almost always say my rosary while driving, or running, or standing in line somewhere. I am also very distractable, so it’s nearly impossible for me to say a rosary without holding a rosary. But perhaps I don’t absolutely need to be carrying around seven rosaries at all times. 4. Trash: Including leaves, popcorn, receipts, shopping lists, coupons, and delicious looking wrappers. 5. Electronics: I carry my iPad around almost all the time in case I get a chance to read (I do almost all of my reading in iBooks now) or write (in notepad). And that’s my phone. It’s all retro Paris Hilton circa 2006, so try not to be too jealous. 6. Money: My wallet, checkbook (also old school), and the $14.71 I found floating around in there. 7. Writing utensils: That’s eleven pens and pencils. Eleven. In the event of a zombie apocalypse I will be able to take a lot of notes about the zombie apocalypse. 8. Paperwork: I carry all the kids’ shot records everywhere I go because otherwise there is no chance I would ever have them with me when we went to the pediatrician’s office. Plus Southwest accepts them as proof of age for lap babies. Two birds, one stone. Also in there, some old appointment reminder cards, used theme park tickets, and a very mangled examination of conscience. 9. Baby clothes: One set of jammies, two onsies, two hats, three pairs of socks, and one stowaway nursing pad. 11. Food: I once read a story about a little old couple who got stuck in a snow bank and survived for weeks on catsup packets they found in the car. I wonder how long a family of nine could survive on two suckers, one squeezie applesauce, and three packages of fruit snacks. 12. Beauty products: Tissues, lip gloss, bandaids, hair band? Reasonable so far. Sunscreen, various creams and hand lotions? Okay, maybe. It IS Southern California. Nail file and clippers? I’m a sometimes nail biter and those things will maybe MAYBE stop me from biting all of my nails off at the moment I notice one of them touching the side of my finger, so those should be in there. Vick’s inhaler? Helps with the pregnancy nausea I had just last, um, seven months ago. Floss? Hmmm, not usually an on-the-go activity. Two bars of soap? Free samples from the doctor’s office. I am so not a bring-your-own-soap places kind of mom. And then . . . there’s the giant comb. And I . . . I just don’t know. Seriously. I have no idea. 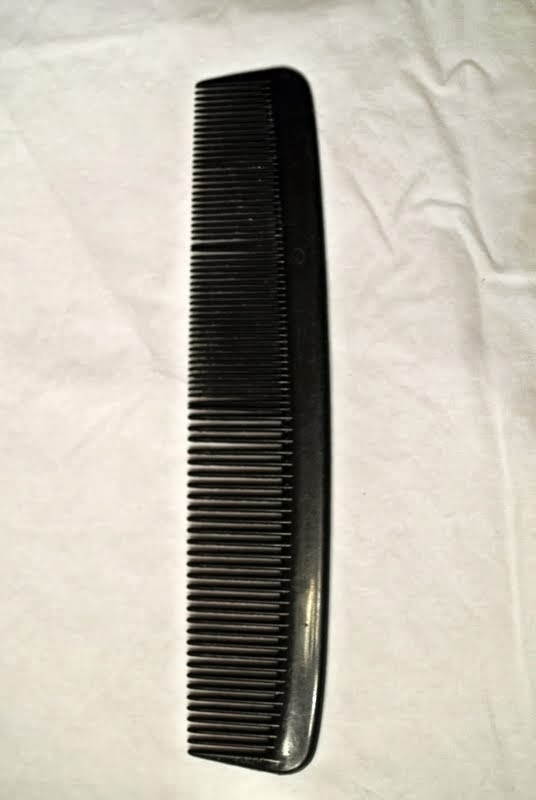 I wouldn’t have thought there was a giant black comb in my whole house, let alone in my purse. It looks like it belongs in the mysterious blue liquid at a barber shop. 13. Dinosaurs. And a tiny sword: No explanation necessary I think. 14. Books: February Magnificat, good to have. January Magnificat, not so much. 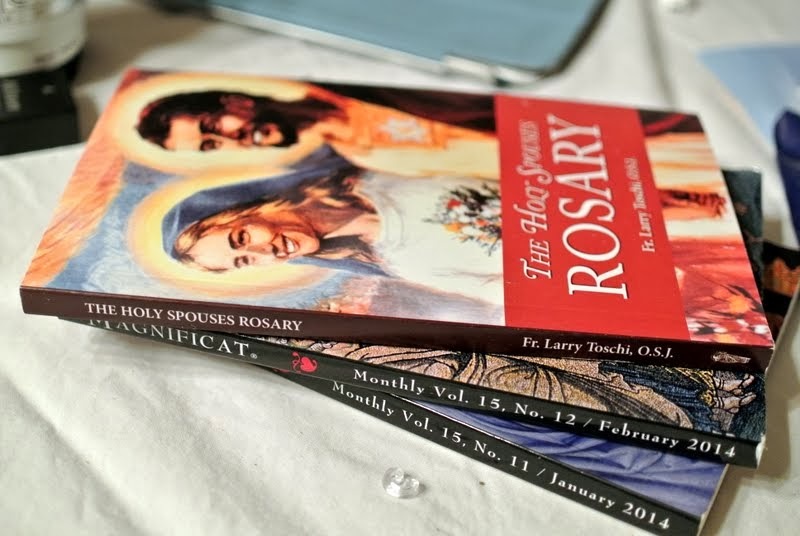 The Holy Spouses Rosary , recommended to me by my friend Micaela . . .
and if you’re coming to the Behold Conference next weekend, YOU could have it next. It’s my favorite thing in here: The ice cream sandwich? But that’s gone. 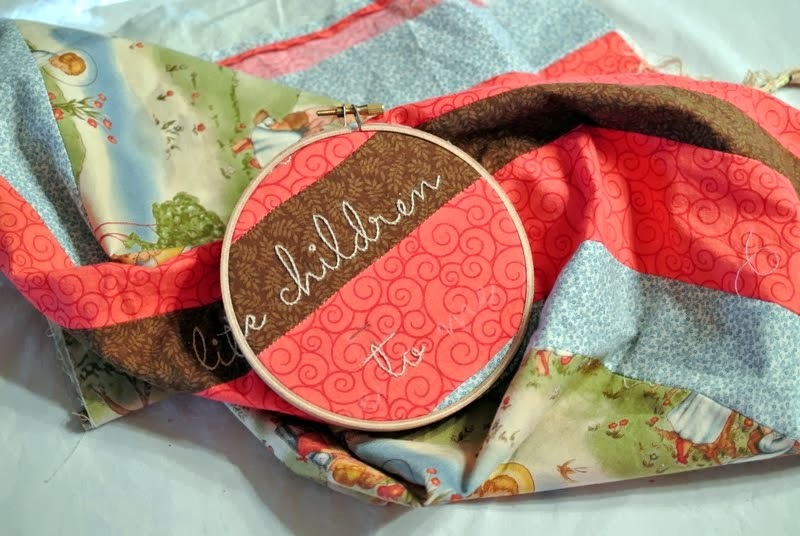 I’ll have to go with the baby quilt. I really like the colors. Wow, I really have a lot of these: I have kind of a lot of lots of things I wasn’t expecting. Bars of soap, diapers, safety pins, fruit snacks, pens and pencils, but I’m going to have to go with rosaries. That is a LOT of rosaries. I’ve been looking for those: The $14.71? No, I didn’t know that was missing. The nail I guess. I think I remember it being up on the shelf above where I keep my purse. But I couldn’t say I’d really been looking for it. Huh. THAT shouldn’t be in there: Almost everything, but mostly that comb. 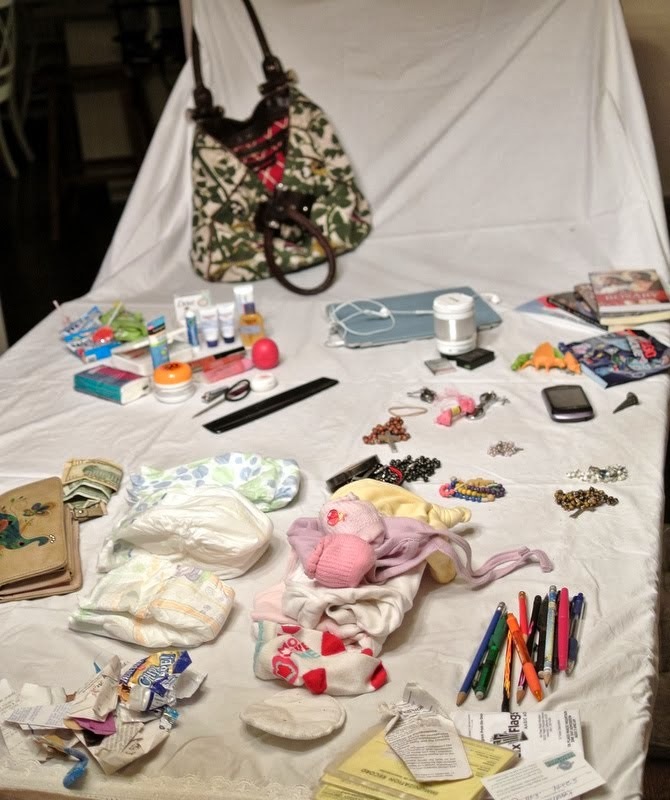 I switched purses to something a little more “late winter/early spring” and put only the least crazy stuff back in there (plus some wipes), and now it only weights 7.6 lbs. Okay, YOUR turn. Dump out your purse and let me know your answers to the official categories, or categories of your own choosing. You can answer in the comments, or link up your blog. No cheating, except for Kelly. Kelly’s funny when she cheats. Not to change the subject, but I LOVE your bird purse!!!! Is it vintage or can I put this in my online cart somewhere? 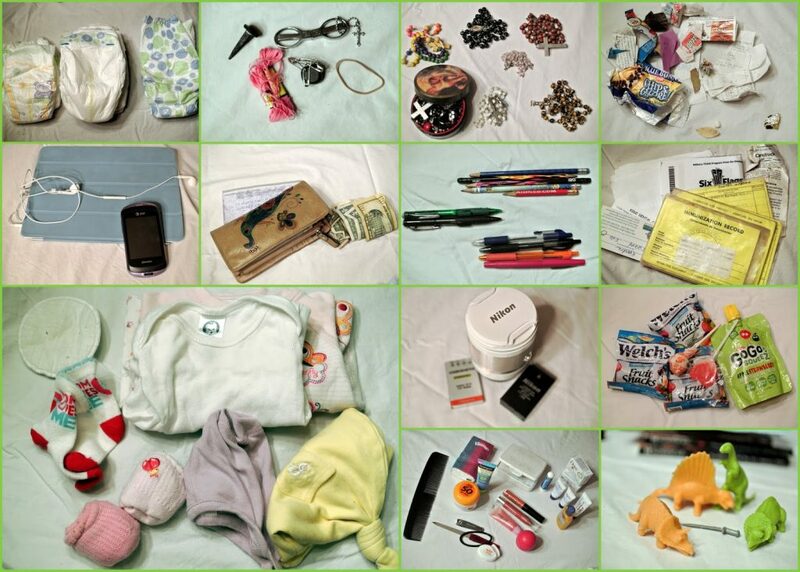 I think your purse dump shows lots of common sense. Always be prepared! Thanks, it was a birthday present from my mother in law about 3 years ago. It's from Anthropologie. 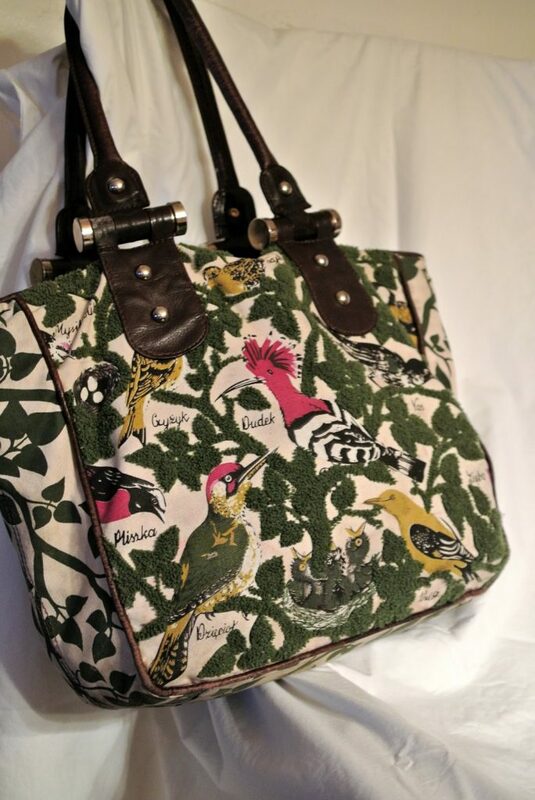 Your bird purse is lovely! When my boys were babies, I always carried two bags. I would leave the heavy diaper bag in the car or stuff it into the bottom of the stroller and keep my purse on my shoulder. Also, I always carry a knitting project with me, but it has it own travel bag. I am a multiple bag kind of gal! My purse isn't that big and I don't keep much in it, now that the kids are older. I did find two dollars and a quarter in the side pocket. It's like winning a scratch ticket! All I could think of was Schmidt from New Girl: "Is that a common barber's comb?!" Where did you find that gorgeous print fabric? I always want fabric like that but I'm never lucky enough to stumble onto it! I'll be at Behold, maybe I'll see you there! I'll check when I'm not trying to get a baby to go back to sleep. It's a Kaufman fabric I think, but I got it when Gus was a baby. And he's six! It's Robert Kaufman "Story Time" Screen Print D# 5829, but I'm not finding it for sale anywhere. Too bad because it's super Catholic. I love it. I might give it a dump later when the kids are napping or otherwise distracted…thanks for hosting this! Also, I meant to say the first time: beautiful job on the embroidery! I'd love to learn how to do that. Wow…shot records? You are ulta prepared. This was fun to read, while I sit here waiting for my boys to finish illustrating their Bible lesson. I LOVE your purses–so cute. I can't participate. I am a freak–a total organista. My purse is always clean and organized. So is my diaper bag. It would bore you all to death–and make you all mutter "freak!" My car is always clean, too. I would NEVER survive a zombie apocalypse. Loved checking out the links when I could steal a moment–hilarious! This was a really great idea, and was very entertaining! And for posterity's sake, I did check my purse. For the record, everything was tidy and in place except I found: four receipts, two gum wrappers, two cough drop wrappers, and one penny. The pack of gum was not in its proper pocket. Ultra-organization was my No. 1 "large family" coping method (7th babe due in April)–especially when combined with being very sick for a long time! I won't even leave a gum wrapper in my car! Well weren't you smart to put down a white sheet to take pictures on. I took pictures directly on my not so lovely floor tiles. Keeping it real, I guess. After all of that, my very favorite part was your camera's selfie. Seriously hilarious! I'm so glad you "got" the camera selfie. I was chuckling about it to myself all day, but I thought for sure I'd be the only one who thought it was funny. I can't wait to do this! I wont have as many awesome photos as you do, and will surely have more unexplainable junk. What a fun link-up. Ok. I pretty much laughed throughout this entire post. I wish my purse had as many useful things in it as yours, but mine is just a giant garbage can. Ha! 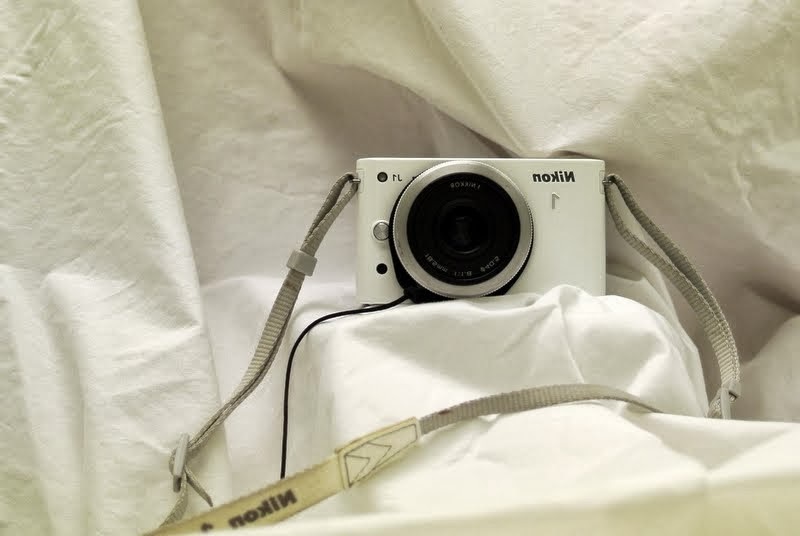 I loved the camera selfie. Too funny! I normally clean out my purse on Monday/Tuesday anyhow, so this was pretty timely… and this one was not so bad! Some weeks I'm amazed at what comes out of there! I love your purse! And you have a lot of stuff in there, I'm impressed. Definitely NOT cheating. My purse is basically just a purse-shaped diaper bag anyway. And thanks! I cleaned out a bag once to discover that I'd been walking around with a stolen Denny's coffee mug and a rather large crystal ashtray for a few months. I know where the mug came from, but the ashtray is still a mystery to me. 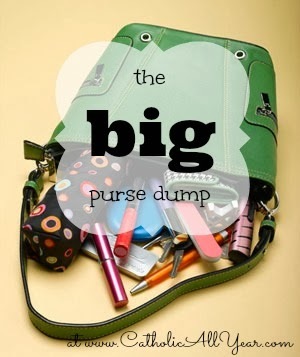 I think this needs to be a once a month feature… it might help me keep my purse(s) clean. Yes, plural because I find when my one gigantic purse is full, I simply add a second "handbag" and schlep away. Day late and $1.13 found in my purse. And a shriveled umbilical cord stump. Nice. 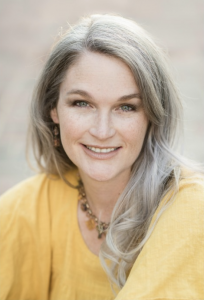 Thanks for the push to continue blogging. I've been on a freeze of sorts from posting anything. I showed Isabella your blog just now. She thought your purse to be quite pretty and also thought you looked very pretty on your profile picture. Have a safe trip to the conference! I want to know about the green purse in your graphic. 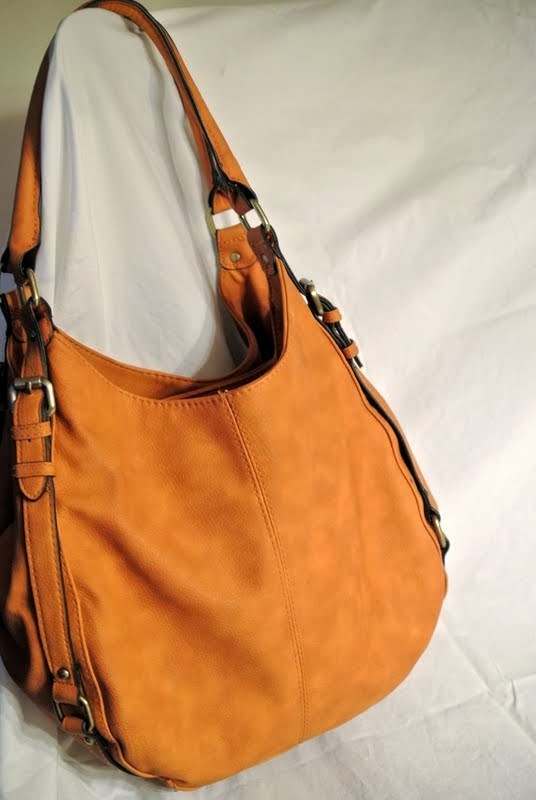 It has everything I look for in a purse, especially one strap of a decent but not too long length. Is it yours? No, unfortunately, it's not mine! I can NOT stop reading these!!! Oh rats, I am too late for the linkup. Here's <a href="http://www.catholichistorynerd.com/2014/03/commuter-show-and-tell-purse-dump.html>my entry</a>. I LOVE these BTW. It's so fun to see how other people pack things. I'm also glad I'm not the only one with a huge bag of random stuff! Yup. I am late to the party but 1) I always win the "what's in your purse game" at showers b/c mine is like this and 2) I have the same purse that you switched to….Love it! 🙂 I'm a new follower as of this week, and I cannot believe I have already de-lurked myself. Granted I did not read them all, but I read about half and none had a tampon, which surprises me. I did see some. But I don't carry them, myself. I've been pregnant or nursing for the last twelve years, so . . . Hey, maybe everyone's using that cup thingy.